On Jun. 22, 2013 local time of New York, a respected fashion brand Oscar De La Renta publishes the newest series of wedding dress on the 2014 New York Spring and Summer Wedding Dress Fashion Week. How will we be shocked by the wedding dress trend brought by the designer Oscar De La Renta who is famous for designing luxury and expensive dresses? After the black-and-white storm of “Wedding Dress Queen” Vera Wang”, Oscar De La Renta will show you her five keywords about wedding dress. From the light blue to white, and then from white to light pink to the end, Oscar De La Renta 2014 spring and Summer Series of Wedding Dress shows the unique features of delicateness and romance, making the fairy tales come true. Multi-level grenadines build sense of clouds and mists; satin wedding dress builds noble and simple temperature; stereo flower-shaped lace makes the white wedding dress more vivid; in additional, there are four special flower girls with different skin colors, perfect combining the lace and the gauze so as to make the fashion show full of children’s interesting. No matter on the fashion show of big brand or on the wedding, fishtail skirt can be often seen. Designer Oscar De La Renta makes full use of lace, gauze and waist folds and so on to make the fishtail skirt more diversified. Overlap the transparent gauzes one by one to build a wispy and fantastic atmosphere, showing an impeccable romantic feeling to those present. No matter the blue transparent opening wedding dress or the last main pink gauze sun-top wedding dress with expansion hem, Oscar De La Renta fully shows every gauze wedding dress in different colors. Brief satin wedding dress builds retro feeling, making the bride more noble and decent. No matter how the fashion trend changes, the brief and elegant temperature of modern women has not ever and never disappeared. Neat and adroit profile tailoring seems to show the most original appearance of wedding dress. In this season, Oscar De La Renta seems to make the grenadine and gauze as the main materials, however, no matter what the material is, lace decoration is the bright spot of the whole wedding dresses. Stereo flower-shaped lace is decorated on every part of the bride’s body, like on the waist, shoulder, and arm, so as to make the wedding dress more vivid and brilliant. 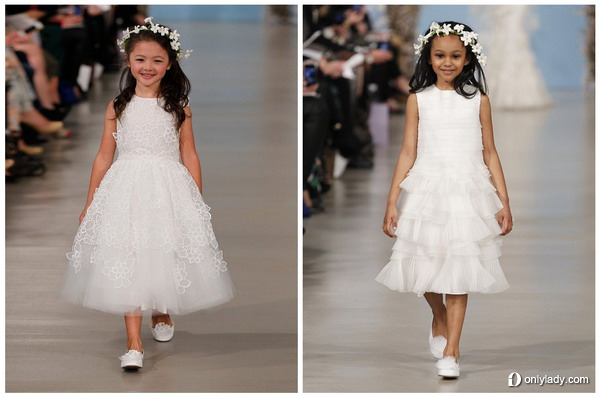 Except the wedding dress, four lovely flower girls make the fashion show full of children’s interesting. Four little girls with different skin colors are just as lovely as faeries, which perfect combine the main elements of lace, gauze and satin and so on, seeming to tell everyone that the bit part on the wedding can also be fashionable and changeable.